Assessment is a critical part of a personal trainer’s responsibilities. It can be used to aid the personal trainer in several ways. The most important function of assessment is to allow you to track the changes that are occurring in your client’s health or fitness levels. Properly tracking these changes keeps you on target with programming, and justifies your services. Assessment should not be downplayed or omitted from the services you offer your client. This course takes you through the basics of resting heart rate, resting blood pressure (video included), height, and weight measurement. With descriptions and video clips you will learn to locate and measure ten skin-fold sites and nine body circumferences. Formulas and equations for Jackson/Pollock and a 7-site body composition, BMI, and calculations for recommended weight ranges. 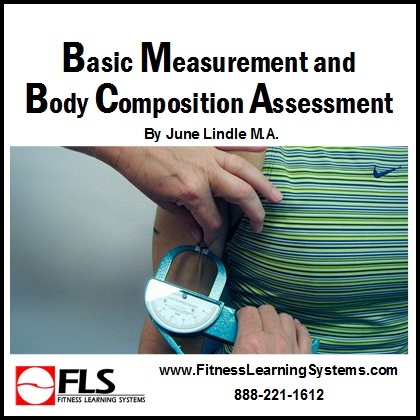 have a better understanding of the Fitness/Health assessment process. understand and be able to practice proper procedures for resting heart rate, resting blood pressure, height, weight, body circumference, skinfold, and BMI measurements. be able to calculate a desired weight or weight range for your client. have learned the procedures for the Jackson Pollock 3-fold skinfold method as well as a 7-fold method. have learned proper technique for anatomical location for body circumference and skinfold measurement sites. be able to avoid common mistakes made for skinfold and circumference measurement.